The area of greatest interest however is to the left of the arched entrance, between the two trees. The photograph shows a third door here, with a rectangular fixed light above it, flanked closely by two tall windows with the shutters closed on the lower casements. This door and pair of windows must correspond to what is shown by Rademaker as a single large glazed opening with a door at its centre, behind the lean-to roof of the shop. The smaller window at the extreme left of the ground floor in Rademaker's drawing has disappeared from the building shown by the photograph. Let us now, following Swillens's lead, superimpose this more accurately dimensioned version of the facade of the Guildhall of St Luke onto 'The Little Street' (Figure 11). We can obtain the correct position by aligning the left-hand end of the new hall's facade with the right-hand side of the arched entrance to the Old Men's House. The door and pair of windows in 'The Little Street' are in the precise positions of the door and pair of windows in the ground floor below the Guildhall. The 1875 photograph shows the fragmentary remains of what Vermeer painted around 1657-58. This implies - as Swillens assumed - that the remodelled building was extended somewhat to the west (i.e. to the left in all the various pictures)(14). In 'The Little Street' there is a second doorway, to the right of the arched entrance to the Old Men's House. The new building fills the space formerly occupied by this doorway and the passage beyond. 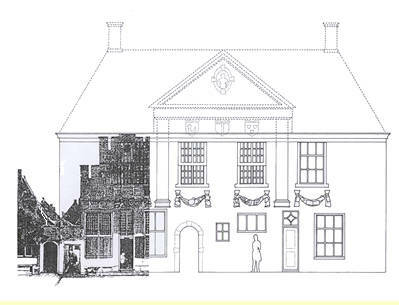 The small window at the extreme left of the Guildhall facade in Rademaker's drawing would thus have been created in the position of the old door. Figure 11. Superimposition of reconstructed facade of St Luke's Guildhall over 'The Little Street'. It is worth noting that in 'The Little Street' Vermeer shows an area of pavement made up of brown and black tiles laid diagonally, in front of the right-hand house; and that the Rademaker drawing seems to show a surviving part of this same pavement, under the lean-to roof of the shop. (No trace of these tiles in the photograph however.) 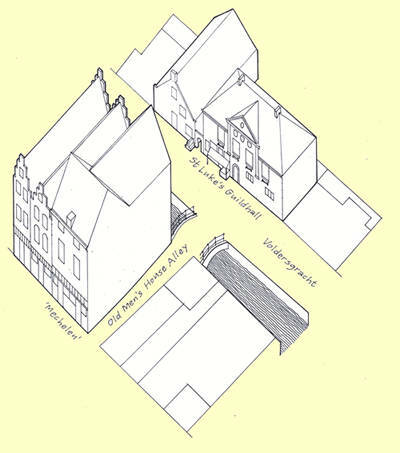 There is also a low wall or bench in 'The Little Street', perpendicular to the house wall, at the left-hand end of this paved area, which appears in the Rademaker drawing. I have made a drawing showing a bird's eye view of the entire group of buildings, as they would have appeared in the late 17th and 18th centuries (Figure 12). The ground plans are based on the 1830 map. The Guildhall is reconstructed following the photograph again, and the archway and house to its left following Rademaker's drawing and 'The Little Street' itself. The reader will appreciate, from the relative positions of the buildings, how the view shown in Vermeer's painting could have been that from a window at the back of 'Mechelen', at its north-west corner. The presumed angle of view is traced on the map in Figure 8. Figure 12. Bird's eye view of St Luke's Guildhall, 'Mechelen' and surrounding buildings as they would have appeared in the late 17th and 18th centuries.